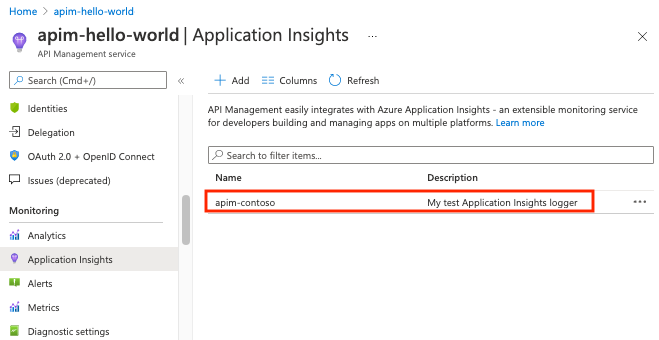 Azure API Management allows for easy integration with Azure Application Insights - an extensible service for web developers building and managing apps on multiple platforms. This guide walks through every step of such integration and describes strategies for reducing performance impact on your API Management service instance. To follow this guide, you need to have an Azure API Management instance. If you don't have one, complete the tutorial first. 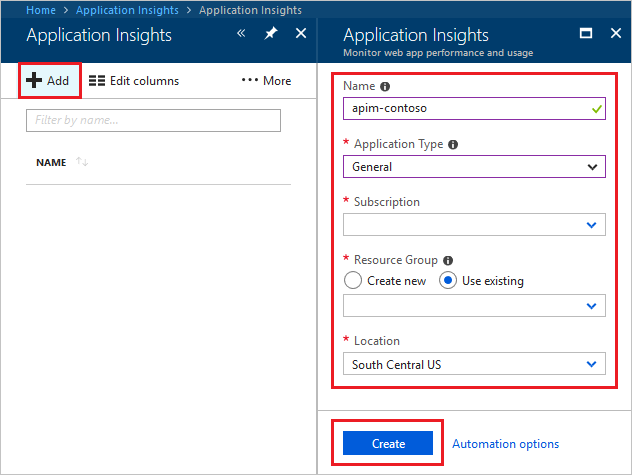 Before you can use Azure Application Insights, you first need to create an instance of the service. Open the Azure portal and navigate to Application Insights. Fill the form. Select General as the Application Type. Navigate to your Azure API Management service instance in the Azure portal. Select Application Insights from the menu on the left. Select the previously created Application Insights instance and provide a short description. You have just created an Azure Application Insights logger with an instrumentation key. It should now appear in the list. Behind the scene, a Logger entity is created in your API Management instance, containing the Instrumentation Key of the Application Insights instance. Select APIs from the menu on the left. Click on your API, in this case Demo Conference API. Go to the Settings tab from the top bar. Scroll down to the Diagnostics Logs section. Select your attached logger in the Destination dropdown. Input 100 as Sampling (%) and tick the Always log errors checkbox. Overriding the default value 0 in the First bytes of body field may significantly decrease the performance of your APIs. Behind the scene, a Diagnostic entity named 'applicationinsights' is created at the API level. Enable boolean Specifies whether logging of this API is enabled. Sampling (%) decimal Values from 0 to 100 (percent). Specifies what percentage of requests will be logged to Azure Application Insights. 0% sampling means zero requests logged, while 100% sampling means all requests logged. 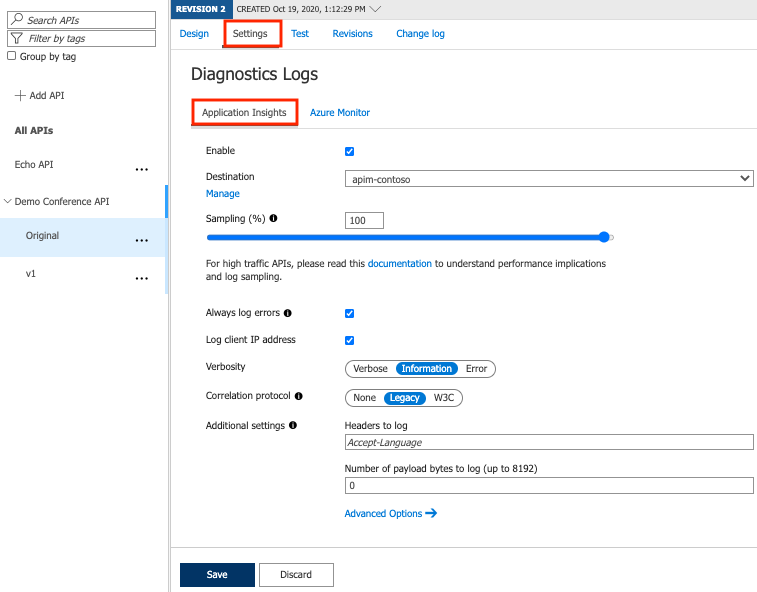 This setting is used for reducing performance implications of logging requests to Azure Application Insights (see the section below). Always log errors boolean If this setting is selected, all failures will be logged to Azure Application Insights, regardless of the Sampling setting. Basic Options: Headers list Specifies the headers that will be logged to Azure Application Insights for requests and responses. Default: no headers are logged. Basic Options: First bytes of body integer Specifies how many first bytes of the body are logged to Azure Application Insights for requests and responses. Default: body is not logged. Advanced Options: Frontend Request Specifies whether and how frontend requests will be logged to Azure Application Insights. Frontend request is a request incoming to the Azure API Management service. Advanced Options: Frontend Response Specifies whether and how frontend responses will be logged to Azure Application Insights. Frontend response is a response outgoing from the Azure API Management service. Advanced Options: Backend Request Specifies whether and how backend requests will be logged to Azure Application Insights. Backend request is a request outgoing from the Azure API Management service. Advanced Options: Backend Response Specifies whether and how backend responses will be logged to Azure Application Insights. Backend response is a response incoming to the Azure API Management service. You can specify loggers on different levels - single API logger or a logger for all APIs. if they are the same loggers but have different settings, then the one for single API (more granular level) will override the one for all APIs. Exception telemetry item, for every failed request. has a response HTTP status code matching 4xx or 5xx. Logging all events may have serious performance implications, depending on incoming requests rate. Based on internal load tests, enabling this feature caused a 40%-50% reduction in throughput when request rate exceeded 1,000 requests per second. Azure Application Insights is designed to use statistical analysis for assessing application performances. It is not intended to be an audit system and is not suited for logging each individual request for high-volume APIs. You can manipulate the number of requests being logged by adjusting the Sampling setting (see the steps above). Value 100% means all requests are logged, while 0% reflects no logging at all. Sampling helps to reduce volume of telemetry, effectively preventing from significant performance degradation, while still carrying the benefits of logging. Skipping logging of headers and body of requests and responses will also have positive impact on alleviating performance issues. Learn more about Azure Application Insights. Consider logging with Azure Event Hubs.